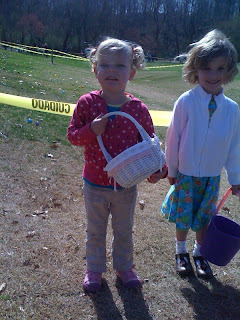 Sierra and I braved East Cobb Park Saturday to go see the Easter Bunny and go to an egg hunt. Basket in hand, we were ready! The plan was to run down the side of the field and start at the other end to get a head start on the eggs down there. Sierra was a champ and scored 6 eggs! She was thrilled with all the candy she got! We had so much fun and its always good just to play with my girl. Easter Bunny pictures soon to follow. (don't even ask who this little girl is. She decided to smile when I said to Sierra, "Smile!"